I recently heard Joseph Mfonyam (pronounced MMM-phone-yam) speak. Joseph is from Cameroon. 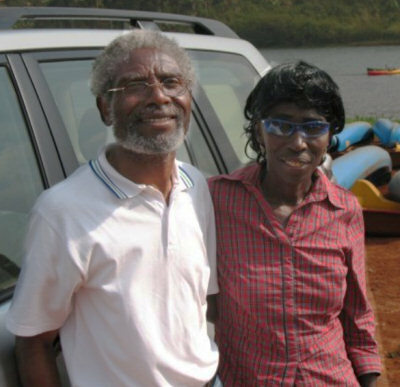 After doing a doctorate in linguistics, he went on to translate the New Testament into the Bafut language. With his graying hair, slim build and his two-year-old granddaughter in his arms, he cut quite an intriguing figure. What’s underneath is even more fascinating. Joseph was on the vanguard of Africans, instead of Western missionaries, doing Bible translation. That trickle is becoming a flood which is cutting a new channel and permanently changing the course of Bible translation. But, there is much more. Within this soft-spoken, grandfatherly academic there burns a fire for truth and transformation – a fire lived out in real-life suffering. As the new Bafut translation was read and taught some saw it as a threat to their traditional religious practices. Unexpectedly that included some “Christians” in the church planted 70 years earlier. Without the Scriptures, the church people were drifting back into their former beliefs and practices. Joseph was maligned and slandered. At one point, it got so tense that someone gave the order to have him killed. But “Nothing and no one is impervious to God’s Word” (Heb 4:13 The Message) Today, not only is Joseph still alive, the Bafut king, who is the keeper of Bafut traditions including religion, has made Joseph his advisor and he admonishes all to read the translation. Church people are rediscovering their true faith. Based on his experiences and struggles, Joseph wrote about traditional beliefs and practices in the church in Cameroon. His books have become part of the curriculum at some seminaries in Cameroon. You can read Joseph’s testimony in his own words here. This entry was posted in Africa, Bible, Bible impact, Bible translation, Christianity, Faith now, Heart language. Bookmark the permalink. Joseph and his experience reminds of Patriarch JOSEPH….